Let's discover one of the most attractive site of Cairo, Mountain Citadel of Saladin, its towers and palaces, museums and hidden mosques. Area under the fortress is full of historical monuments and interesting places to visit. Citadel is the highest point of Cairo, together with its beautiful mosque of Mohammed Ali it became the symbol of the city. The place can be divided into 2 parts: The Northern Enclosure and the Southern Enclosure. The Northern one, surrounded by massive walls and towers, has always had a military function while the Southern enclosure with smaller, more irregular walls and towers, was the rulers’ residence. Let’s discover the Southern Enclosure and explore as many places there as it is possible to do just in one visit. Visiting the sites in the Citadel involves a great deal of walking and stairs climbing: stairs to Gawhara palace, stairs to the Police museum as well as endless stairs inside the Military Museum. So, keep in mind that visiting the Citadel is not a leisure walk but an adventurous trip to the past. When entering inside the Citadel, just past the tickets office let’s walk strait up the hill towards the Mosque of Muhammed Ali which dominates the skyline of Cairo from atop the Southern Enclosure. Muhammed Ali began the construction of the mosque in 1824 by tearing down the old Mamluk palaces here, one of them was the Great Liwan. Then he filled in the area, raising it up with 10 meters of rubble, and created a new terrace on which to build. But before reaching the mosque we will pass a unique palace which is still standing in front of the mosque, to the left side of the pass when we walk towards the mosque. This is Gawhara Palace, built by Mohammed Ali in 1814. 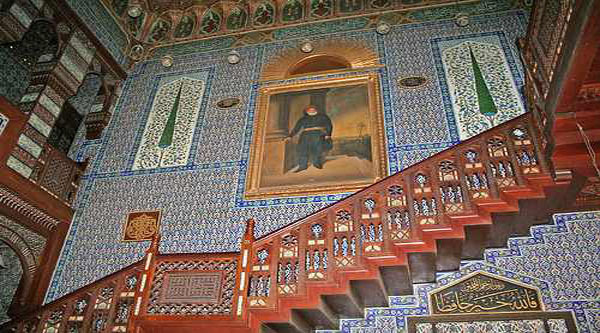 He and his family lived here until 1827, when the Harem palace was completed. After Mohamed Ali moved, his visitors were used to stay in this palace. The palace seems rather modest since the electrical fire in 1972 destroyed a large section of it. The palace after the restoration was opened to public for while and now, for 10 years already it has been closed for reconstruction. The day, when we’ll be able again to see the palace, is unclear. For now you can see just outer walls of the palace and read here, how it looked in the past. Our next stop will be at a mosque which is located in the courtyard between the Police Museum Terrace and the entrance into the Northern Enclosure, it is a well preserved example of a Mamluk mosque, al-Nasir Mohammed Mosque. The original mosque was constructed in 1318, but the mosque as you see it today dates from al-Nasir’s rebuilding of it in 1335. This mosque served as the congregational mosque for the Citadel until the one of Mohammed Ali was completed. Walking into the courtyard with its arcade or covered porches you see the qibla wall with mihrab niche straight ahead. There are three niches in the mosque: a main one in the center and two smaller on each side. On the wall you may notice the remains of inlaid marble panels, the same type of inlaid decoration used in al-Nasir Muhammed’s Striped Palace Ablaque Palace), which you can look down into from the Police Museum terrace. On leaving the mosque of al-Nasir Mohammed let’s turn right and go around it, taking the 1st road to the right on the east side of the mosque. This will lead us to a tower that stands over a famous Yusuf’s Well, which goes down 97 meters to the level of the Nile. Two aqueducts also supplied the Citadel, discharging water near the base of the hill that was then raised to the top by a series of water wheels. Directly opposite the entrance to al-Nasir Mohammed’s mosque lays a site known as Qasr al-Ablaq. Now it is really no more than just a name, but once "Striped Palace" was begun by Ashraf al-Khalil and finished by al-Nasir Mohammed. Walking away from the north side of the Mohammed’s Ali mosque you pass through a stone gateway called Bab al-Alam. 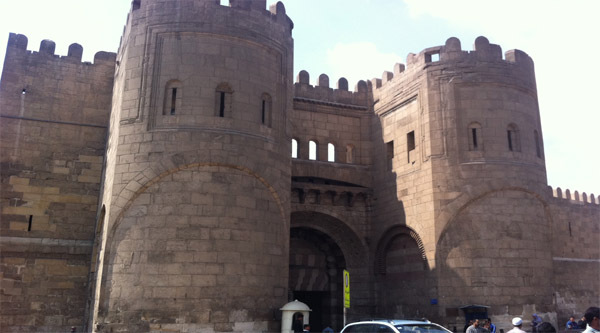 The gateway dates back to Mohammed’s Ali reign but the upper wall was once restored by Ibrahim Pasha. Going up towards a terrace we can see a now-closed military prison on our right side. The prison has 40 cells in two rows, with an open corridor in between. The oldest part dates back to the time of Khedive Ismail, and it was completed in 1882. The prison closed in 1984 and became a museum. Passing by the prison we go straight ahead to the terrace, on our left side is a fenced-off excavation area with what remains of the Al-Ablaq Palace, built in 1315. What was left of this enormous palace Mohammed Ali filled in and covered when he built the terrace for his mosque and a lower one for cannon embankment. Now time to explore the Police museum and Fire Engine Display. On the side of the prison building open to the terrace and between the cafeteria and the police Museum is a large room with antique fire engines that were once used in Cairo. The two oldest are on the right side of the room: an engine with a hand pump from 1766, and another from 1885 with a steam engine to run the pump. On the other side of the room are two fire engines made in England in 1936, as well as a ladder on wheels. Helmets, axes, old fire extinguishers and other equipment are against the wall. Now let’s leave the terrace and walk towards Northern Enclosure which we enter through the Bab al-Qulla, built originally in the 13th century by the Mamluk sultan Baybars. As the original gateway was narrow Mohammed Ali enlarged it so that his carriages could go through. Straight ahead we find the Harem Palace, built by Mohammed Ali in 1827. Three separate wings – central, east and west – make up the palace. 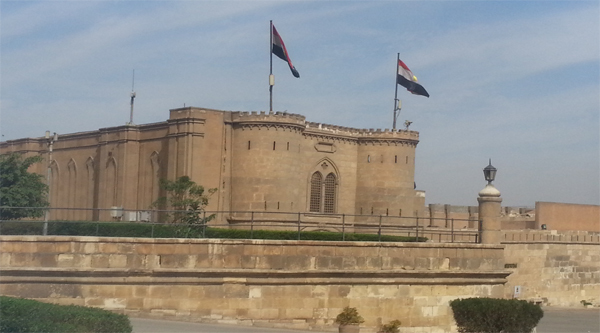 During British occupation of Egypt, British troops were stationed in the Citadel, and the central wing of the Harem Palace was used as a military hospital. In 1947 the British evacuated the Citadel and in 1949 the palace was first opened as a museum. Nowadays the palace hosts National Military Museum and in front of it is an equestrian statue of Ibrahim Pasha, the exact reproduction of one that is in Opera square at Cairo’s downtown. Coming out of the Military Museum, let’s walk completely around the long wing of the building on our left side. The road on the other side leads straight and then curves to the right into a large open area of the eastern part of the Northern Enclosure. Virtually no one ever walks this far into the Northern Enclosure, so it is wonderfully deserted. A sign points the way to the Carriages Museum, which also has a row of metal horse heads on the outside wall, so it is easy to spot. A pleasant garden fills the middle of the space, and on the far side is the Mahka, an area used for outdoor musical performances. The mosque of Soliman Pasha is at the far north of the enclosure, opposite the Carriages Museum. When exiting the mosque let's go north into the Archaeological Garden Museum. This is a grand space featuring primarily columns, plant borders, and an untrammeled expanse toward the two Ayyubid towers along the walls that guard the pass. You can walk along the walls and enter the towers – Burg al-Ramla and Burg al-Hadid – from which there is a good view of the Northern Cemetery. Burg al-Gadid or a New Gate contains a most important feature, a bent entrance, which forced the enemy to expose its non-shielded side to the defenders.